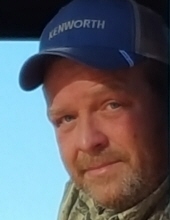 Kevin L. Stevens, 47, of Moss Point, MS made his final haul on Monday, November 19, 2018. He was born on October 8, 1971 in Yazoo City, MS to the late Vernon A. Stevens, Sr. and Dorothy Sutterfield. Kevin drove a truck for Big Creek Farms and was a very hard worker. He was an avid crappy fisherman. He loved his family, especially his grandbabies, to whom he was affectionately known as, "Pawpaw Kevin" and "Kebby." Left to cherish Kevin's memory is his wife of 11 years, Mary Kaye Stevens; children, Courtney Stevens, Rodney (Ashley) Barker, Lacinda (Zacky) Dunaway, Amanda Thornhill, Hunter (Amanda) Stevens, Katie Stevens, and Nicole Stevens; grandchildren, Avery, Axyl, Raylee, Ryder, Riley, Layla, Lyla, Lyle, and Taylin; brother, Vernon A. Stevens, Jr.; nieces and nephews, Duane, Nicki, Taylor, Josh, and Destiny; along with numerous other relatives and friends. The family will have a memorial service for Kevin at a later date. To send flowers or a remembrance gift to the family of Kevin L. Stevens, please visit our Tribute Store. "Email Address" would like to share the life celebration of Kevin L. Stevens. Click on the "link" to go to share a favorite memory or leave a condolence message for the family.